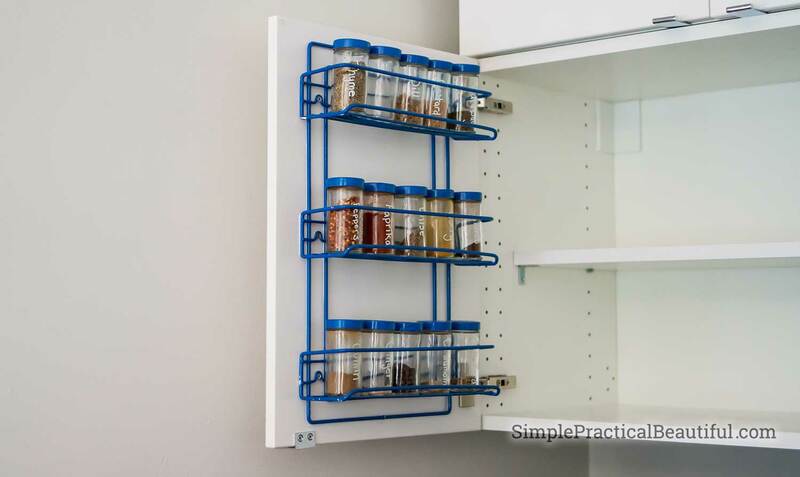 Adding a spice rack to a cabinet door is an easy DIY home project, especially on an Ikea kitchen cabinet. It makes spices and jars easy to reach but hidden from view. 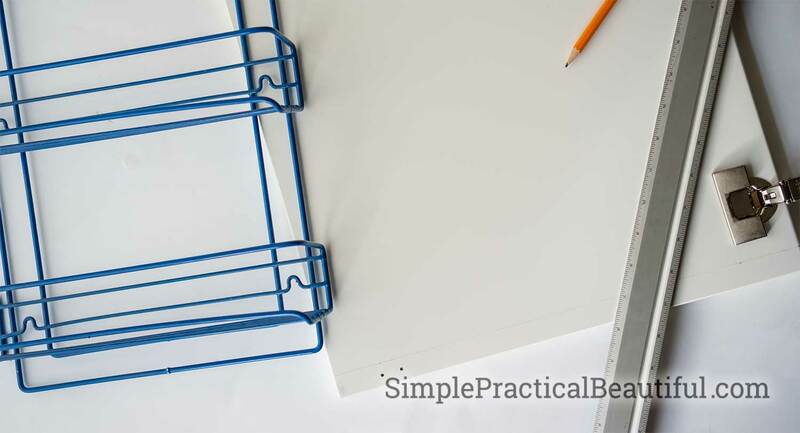 Before our kitchen remodel, I found some wire spice racks at a thrift store and gave them a makeover—you can read about my spice rack makeover here. I liked how they turned out so well that I hung them on the wall in my old kitchen. But now our kitchen is a very modern-looking Ikea kitchen so the spice rack needs to be hidden inside of a cabinet. 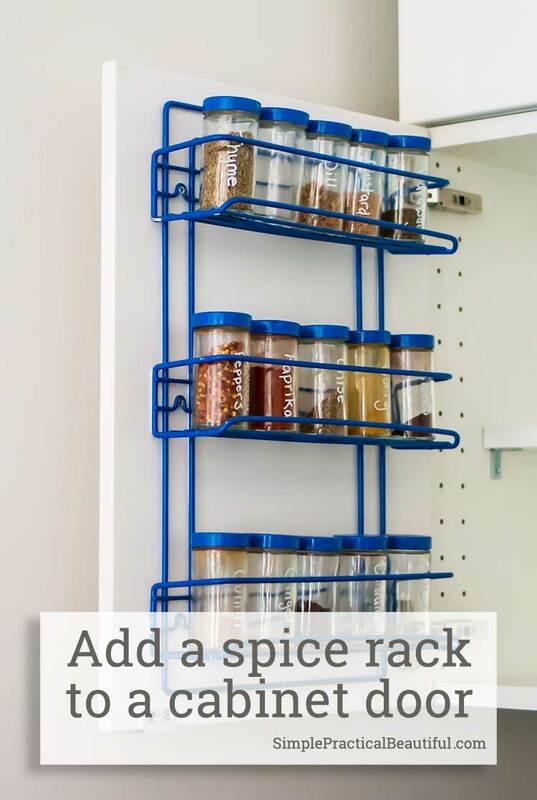 Luckily, I have a cabinet right next to my range that fits the spice racks perfectly. Now my spice rack is convenient to reach while I’m cooking and hidden from view when I’m not. 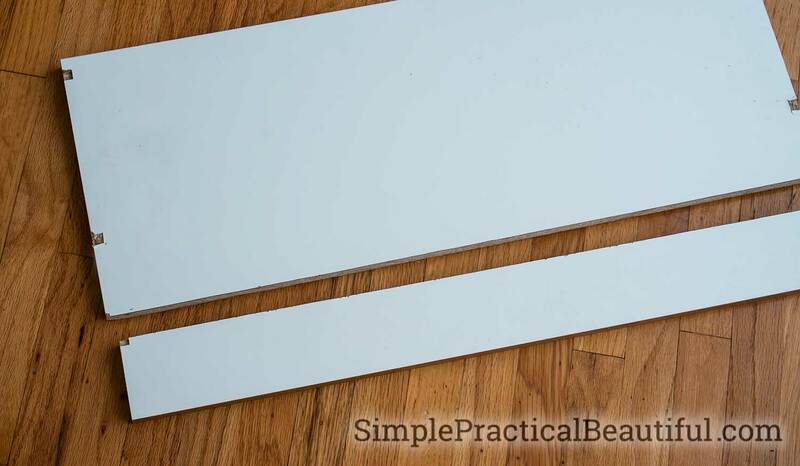 Ikea cabinet doors are easy to install and remove because they are made to be assembled by homeowners. 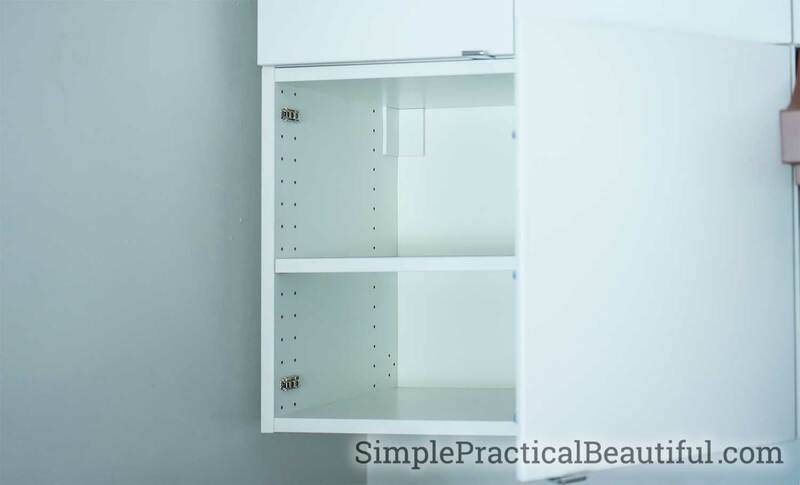 You can watch my video on installing a cabinet door here. Because the cabinet door is easy to remove from the cabinet box, I removed the cabinet doors to mount the spice rack. You could also attach the spice rack while the door is on the cabinet, you’ll just be working against gravity. 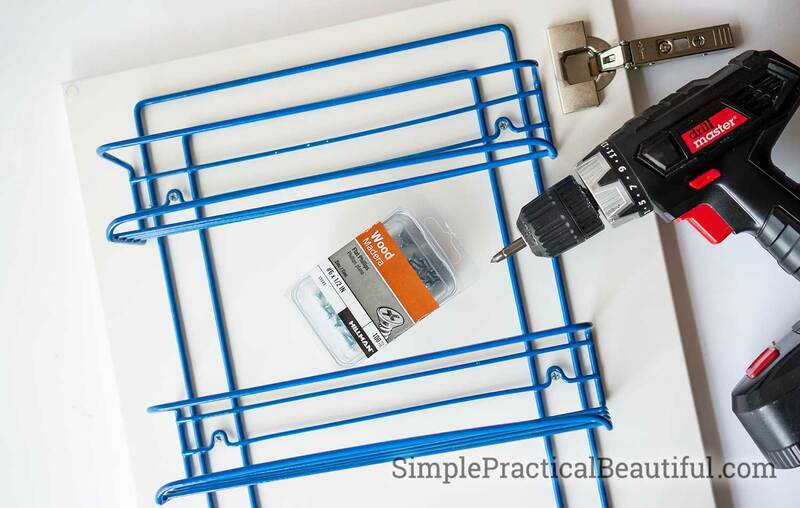 The spice rack must fit inside the cabinet without running into anything, so double and triple check your measurements before you start drilling. The box of my Ikea cabinets are 3/4 inch thick, so I made a mark on the door 3/4 inch from the top and 3/4 inches from the bottom. 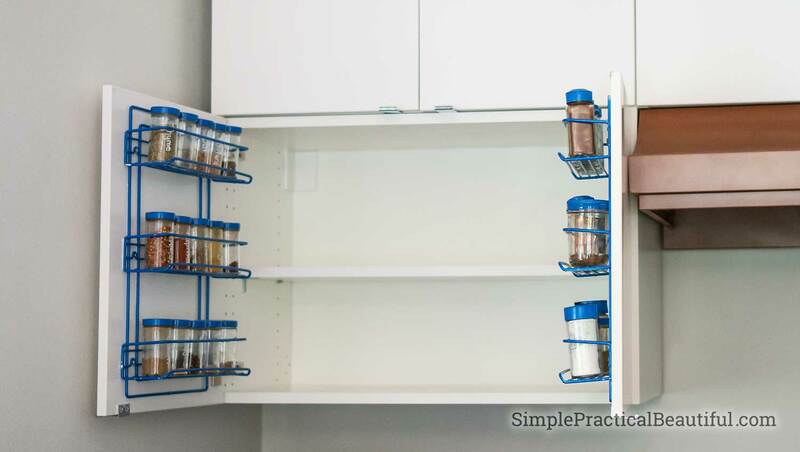 The spice rack and spice jars cannot go into this area or they will run into the cabinet box. Please note, that includes the spice jars on the top rack. They may stick up higher than the rack. Also, The spice rack also cannot go within 3/4 of an inch from either side, but my spice rack is narrow enough that I didn’t worry about that. 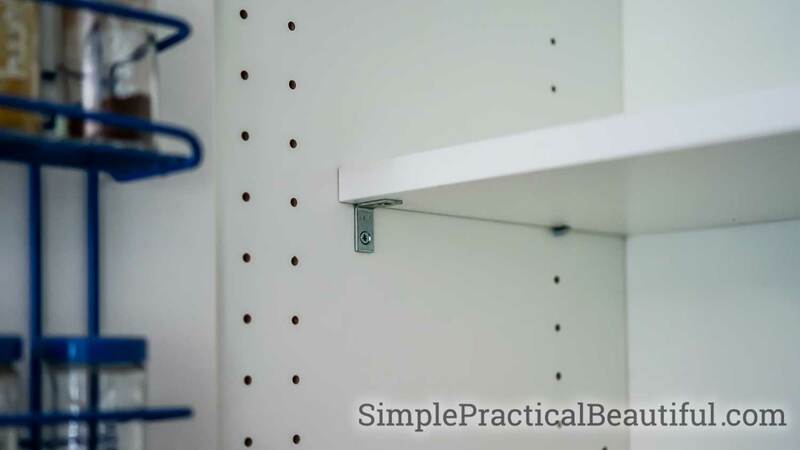 Once I had my borders marked, I place the spice rack on the door and marked where the screws needed to go to attach the spice rack to the door. My cabinet doors are 5/8 inch thick, so I used 1/2-inch screws. Measure your cabinet door thickness and measure again, then hold the screw up next to the side of the door just to make sure. If the tip of a screw comes out the front of the door there is nothing you can do to fix it. Be careful. Next, I drilled pilot holes for the screws. I just barely drilled into the door because I didn’t want to take any chances accidentally drilling through the other side. Remember, that can’t be fixed. Finally, I mounted the spice rack on the cabinet door with 6 screws. The shelf inside the cabinet also needed to be modified to make room for the spice rack. The spice rack is 2 1/2 inches deep, so I removed the shelf from the cabinet and marked a line 2 3/4 inches from the end. I marked it on the back of the shelf so that after I cut off the 2 3/4 inches, the front of the shelf will still have a nice, white edge and the back, cut side (that shows mdf) will be hidden. The whole shelf will be 2 3/4 inches back from where is used to be. After cutting the shelf, I also added a new notch for the shelf pins to nestle into (i.e. Those little cylindrical metal pieces that make the shelf adjustable in the cabinet). I did that with a 1/2-inch chisel. It turned out a little messy but it will be mostly hidden on the bottom of the shelf. My last alteration was adding a small bracket to the bottom front of the shelf because the shelf no longer reaches the holes where the shelf pins insert so it needed something else to hold up the front of the shelf. I used my 1/2-inch screws for the bracket so they wouldn’t go through the shelf or the cabinet box. I attached the door with the spice rack back onto the cabinet and it closed perfectly. I put all of my spice jars in the spice rack, and now my spices are hidden when the cabinet is closed but easy to find and reach when I open the cabinet.